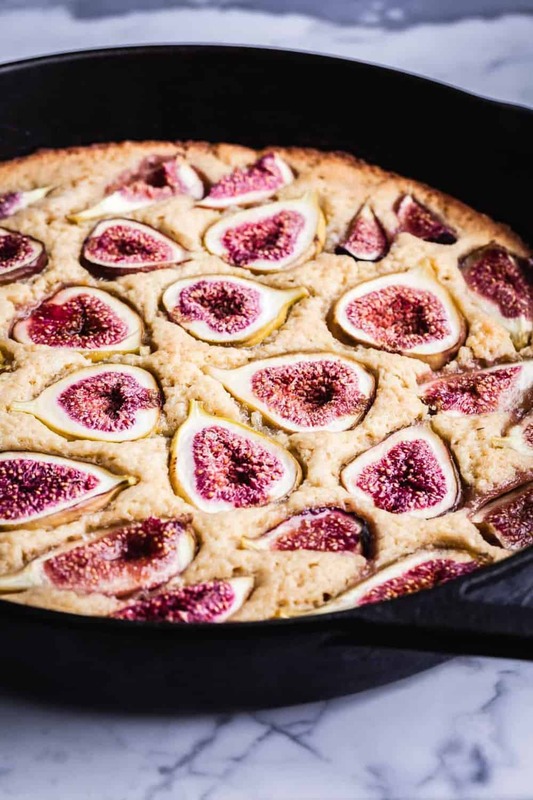 A deliciously easy to bake gluten-free almond and fresh fig cake easily made by putting all the ingredients in a food processor and topped with figs or another seasonal fruit of your choice! The recipe?!?! What recipe? By the time they reached out I really had no idea exactly what had gone into that batter. So I set out to make it again, this time with a pad and pen in hand. So there ya go…. the recipe exists now and it really all started as a photograph. The deliciously triple almond batter is almost reminiscent of marzipan. Triple almond cause there’s ground up almonds, almond flour, and almond extract. It’s dense and chewy with hints of lemon, maple and cinnamon. It’s on the not super sweet side as far as desserts go and would work just as well for breakfast as it does for a mid day snack or post dinner treat. 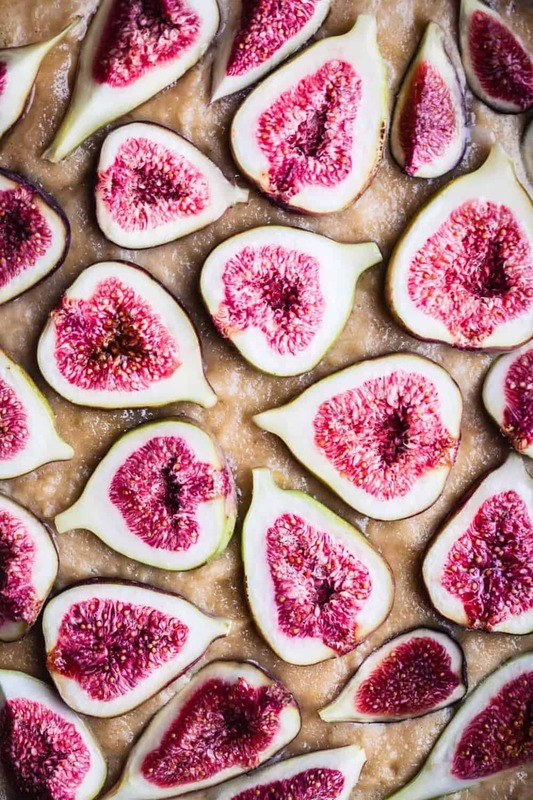 I think figs are one of the most photogenic foods around. I actually have a deep dark dirty secret that I’ve shared on here before: I don’t actually like figs. I just LOVE putting them on so much of my food cause they’re absolutely divinely stunning! They soften and become almost jammy when baked here so if figs are you’re thang then this cake if for you! 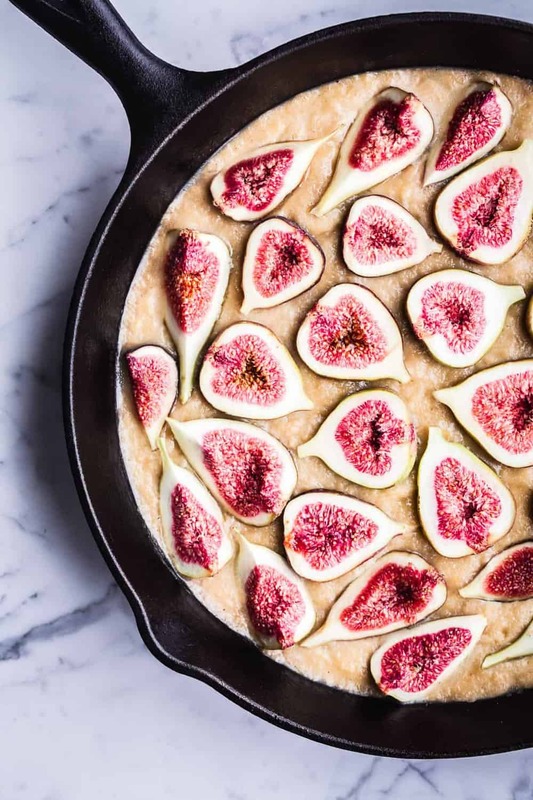 With figs, ripeness is everything… so pick your figs wisely. They are one of the most perishable fruits around so buy them with the intention to use ‘em up within a few days. When choosing your figs, ya want them to be soft, to give a little with the slightest pressure, and def not be either mushy or hard. Avoid figs with bruises and check to see that the stems are firmly in place — a wiggly, loose stem is a dead giveaway for a mushy fig. 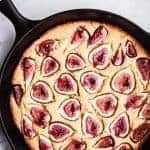 When you cut into the flesh of a rip fig it’s bright and juicy…sprinkled here with a bit of sugar pre-oven the caramelize when baked too ~ yum! And if figs are not your thang, then I got 3 options for ya: eat around them, skip making this cake, or (the most fun thinks me!) just top this cake with a different fruit. If it’s a fruit, it can be a topping on this cake! To date, the only other fruit I’ve tried in this recipe is plums and it came out wonderfully delicious. If you make it with another fruit please share in the comments below. Or if you are indeed a fig lover, but they’re out of season, then it’s your opportunity to play away with another fruit too! The idea is similar to my Amaretto Mascarpone Cheesecake in the sense that the toppings are flexi. My recipes are often more like guidelines with multiple options to go in, and I always suggest ya go with the one ya like best and is in season. There’s no need to miss out on this very almond-licious (and gluten free!) batter just cause there a lack of fig situation going on. Make sense? The batter quickly comes together in a food processor. Almonds are ground up first, joined by other dry ingredients, the wet ingredients are whisked and join the food processor party, everything is combined and just like that (it’s really that easy!) the batter is all ready to be poured into the pan, topped with figs and into the oven it goes. I’m a big quick and easy batter comes together in the food processor kinda gal! So let’s make quick and easy delicious sweet treats and…. Put almonds and 1/4 cup sugar in a food processor and grind to a coarse powder. Add flour, baking powder, cinnamon and salt; pulse to combine. In a mixing bowl, whisk together eggs, melted butter, maple syrup or honey, almond extract, vanilla extract, lemon zest and juice. Add to almond mixture and beat for a minute until batter is just mixed. Butter a cast iron skillet (or other cake pan) and pour batter in, smooth top with a spatula. Remove stem from each fig and cut in half. 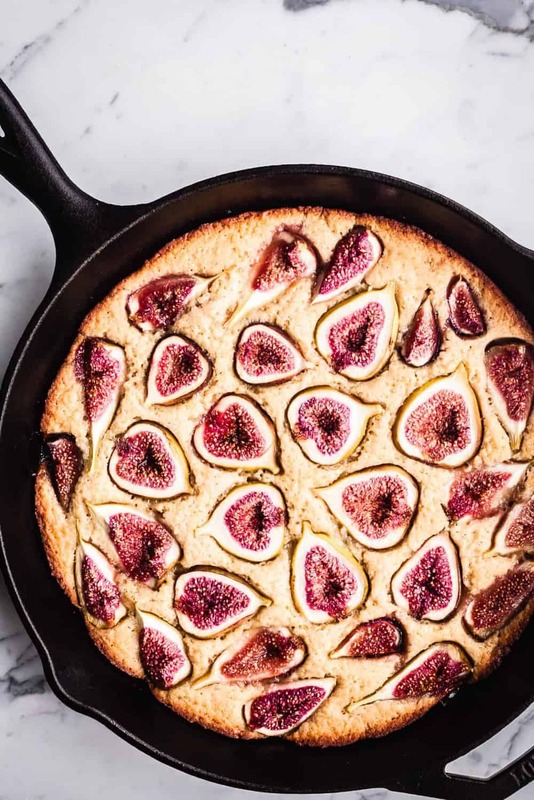 Arrange fig halves cut-side up over the batter. Sprinkle figs with sugar and bake for 30 minutes, until golden outside and a toothpick inserted comes out clean. This is beautiful (and I wish I’d someday have a lot of figs to deal with)! But a question, isn’t almond flour just ground almonds? In that case are you just grinding almond because they aren’t blanched? Thanks! Yes! And the consistency is quite different when I grind up almonds myself vs buy almond flour. But you can go all ground up almonds or all almond flour here…. I enjoy mixing both. And you can make the cake with another type of fruit topping too until you get some fig bounty :).